Welcome to the Crochet With Us Group Crochet-A-Long! To take some of the work out of making your Poncho, Amy and I have created individual posts for the full patterns in the sizes. You won’t need to reference the charts and the complete pattern can be found in one post. We still link to the tutorials for photo support if you get stuck. Remember our sites are both PrintFriendly – my button is located just under my signature at the end of the post! Amy and I are very excited to make this project with you and we have tried to give you lots of options too! This poncho is great for back to school and it is available in many sizes from baby to adult – so pick your size and Crochet with Us! Amy and I will be taking turns posting each part of the CAL. You will receive 2 posts each week; one on Monday and one on Wednesday. This Introduction Post will be updated with each Post of the CAL as it is released. You may wish to Bookmark this post to find and return to it more easily! Each Poncho is created by assembling 2 rectangles together. Before you can assemble your poncho and add the edging and neckline to it you will need to have completed your 2 rectangles. You will need to complete your 2 rectangles and weave in your ends by Part 9 when we show you how to assemble and add your neckline to your poncho. You will need to complete each post we share 2 times to have your finished rectangles. You can either follow through all of the posts one time and then make the 2nd rectangle. Or, you can make Part 1 two times immediately and add on Part 2 to each piece after the second post is shared, and so on to complete both rectangles simultaneously. then proceed to Part 2. Remember you can PRINT or SAVE each post in the CAL using the Print Friendly Button included at the end of each Post. This Poncho is very easy to customize. Amy and I have worked out the stitches you will need to chain for your starting chain, for a variety of sizes using the yarn we selected for our Ponchos. The yarn I selected for my poncho is Red Heart Soft Yarn and I will be using a 6.0 mm (J) Crochet Hook. For the CAL this will be listed as Option 1. The yarn Amy selected for her poncho is Knit Picks Gloss Yarn and she will be using a 5.0 mm (H) Crochet Hook. For the CAL this will be listed as Option 2. The totals indicated at the end of each row are the number of stitches for the row and they are listed in this format (Option 1 Stitch Count, Option 2 Stitch Count). Please note the measurements taken are from the starting row of the project to the end of the last row noted – some stretch takes place as the fabric relaxes. Option #1: without taking colour changes into consideration I used 282 g Red Heart Soft Yarn to make Darla’s poncho (Child size 6). For Mya’s Poncho (12 months) I used 128 g in total. Amy calculated the yarn amounts for us. Thanks Amy! These totals are in yards. Please note these are estimates of yardages only. Since this pattern is based on different stitches there will be some variation in the yardage you need depending upon how many times you will be repeating specific stitch patterns (some use more yarn than others – like Popcorn stitches). We’ve tried our best to give you a yardage based on size. I always recommend buying a little more than you need in your dye lot just in case as most yarn stores will accept a return if you do not use the product. If you would like to make your poncho in a different size here are the measurements. Here is a helpful set of charts to compare the clothing sizes for a few different Countries. Please note the charts may not be fully viewable on mobile devices. The sizes included in the first chart are: 3 months, 6 months, 12 months, 18 months and 24 months. Please leave us a comment if you need a size and what type of yarn (DK or WW) and we will comment to tell you the measurements and starting stitches. Please note the charts may not be fully viewable on mobile devices. The sizes included in the first chart are: Child Size 2, 4, 6, 8 and 10. Please leave us a comment if you need a size and what type of yarn (DK or WW) and we will comment to tell you the measurements and starting stitches. Please note the charts may not be fully viewable on mobile devices. The sizes included in the first chart are: Youth Size 12, 14 and 16. Please leave us a comment if you need a size and what type of yarn (DK or WW) and we will comment to tell you the measurements and starting stitches. Please note the charts may not be fully viewable on mobile devices. The sizes included in the first chart are: Woman Sizes X-Small, S/M, Large/1X, 2X/3X and 4X/5X. Please leave us a comment if you need a size and what type of yarn (DK or WW) and we will comment to tell you the measurements and starting stitches. You can either use the starting chains we have calculated based on our gauges; or you can crochet to the measurement specified as the width in inches for your size. Remember to measure this width after Row 2 of the pattern is complete. The measurements listed are the full size of the rectangle; for this project you will need to stop crocheting approximately 1 inch before your length is reached as we are adding an edging to the poncho. If you want to make your poncho using a different yarn and hook combination just use the measurements for the rectangles above (width and length) for your specific size and after Row 2 be sure your width measurement is the one indicated in the chart (or very close to it). If you want a poncho which is wider you can add extra stitches to your starting chain. The poncho is written in a pattern with multiples of 2 stitches. So be sure you make your stitches a multiple of 2 stitches when you increase the starting chain length. 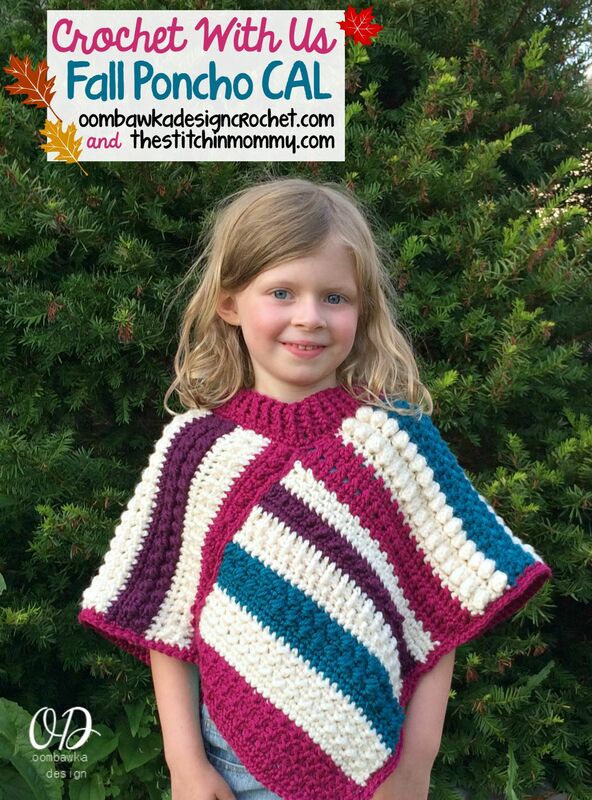 You will need to make 2 rectangles to make this poncho; each rectangle is the same size. Complete each Part below from 1 – 8, two times. I have a PrintFriendly button at the end of each of my posts. You can print, or save a personal PDF copy of my posts/patterns easily 🙂 and Amy has PrintFriendly too! Here’s How to Print or PDF Patterns at The Stitchin’ Mommy. A year after I got the pattern I’m starting the poncho, still working on 2018 Christmas gifts. I want to use Vanna’s yarn, but am unsure how much to purchase of each color. Any way of guessing? Rhondda, I’m looking for the pattern for a size 10 CAL poncho and can’t seem to find it. Hi – I just found this via The Stitchin’ Mommy on facebook. I’ve been crocheting for almost 3 years now but still consider myself a newbie. My question is about the yardage. The chart gives estimates for yards (Baby Size:	3 mos – 166	6 mos – 190	12 mos – 242	18 mos – 270	24 mos – 300 WW). If I was to use 3 colours for a 6 month old, is this estimate per colour (190×3) or in total (190/3)? Does that make sense? I love the look of this pattern. My daughter is getting married soon and I’ve been busy doing things for the wedding, but planning on starting after I finish that. Thank you! 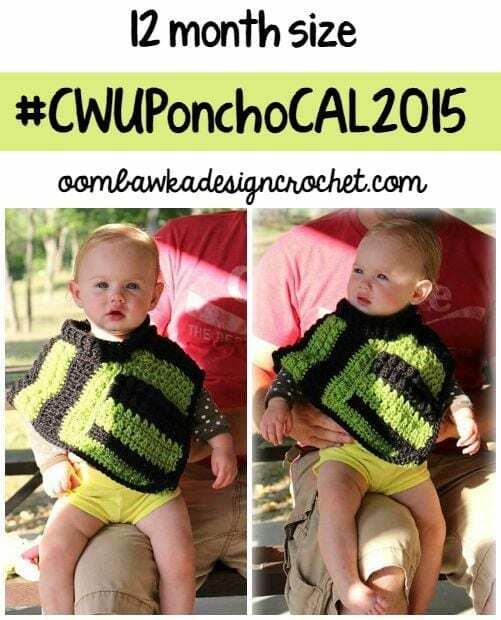 Crochet with Us – Fall Poncho CAL Introduction Post • Oombawka Design Crochet. This is so adorable, I just had to share this with you. Never mind, it was brought to my attention that I missed the part about repeating rows 1-8 twice. Hi, this has also been asked on the Facebook page but I thought I would also ask here. After looking at part 8 this morning, rows 42 – 69 have not been posted yet. Hey, thanks so much!! its such a help and even better, it turns out I’m working the right size, who knew haha. Hi thanks so much, I’m wanting to make one for my 2 year old but she is somewhat tall so fits into age 3 clothing. Which chart should I work from? I have been trying to follow the poncho CAL. However, I’ve run into a problem. Parts 2 and 4 are posted on thestitchingmommy web site and I cannot download those two parts. Parts 1, 3, and 5 that are posted on this site are no problem. Is there any other location to download the parts that are currently posted on thestitchingmommy web site? Ah thank you for clarifying, much appreciated. Not sure what size mine will come out at haha as I don’t know the American sizing. I’ve just started on this and caught up, but as Ihave a tendency to zip ahead, thought it’d be a goodidea to recheck this post. Can I get a little clarification please. It sayseach poncho is two rectangles, does this mean one full poncho is made up of two identical rectangles? So I would for example work parts 1-5 and then work 1-6 agai? Welcome Cathy! Thank you for joining us for he CAL! Hi Aimee, I’m happy we got the Facebook Issue fixed 🙂 I hope you are enjoying the CAL! Hi Lynn, You are very welcome 🙂 It is wonderful you are crocheting items for your daughter’s wedding – it will make the day even more special and memorable for her. Have a great day! If you are using Worsted Weight (and following Option 1 with me) you start with a chain length of 34 sts for size 6 and 38 sts for size 8. If you are using DK (and following option 2 with Amy) you start with 48 sts for size 6 or 52 sts for size 8. Thank you Rhondda for the wonderful pattern and the many different sizes. I am making my granddaughter one now and as she grows I can keep her looking cute. I might have to make her and I matching ones. Thanks again!!!! I really like this project. I like the wide variety of sizes available. I wish I could start this now, but I have to finish the projects I have for my daughter’s wedding! Looking forward to when I can start. Thank you both for sharing your talents!!! This is a really fun project. I have tried many CALS before and got very overwhelmed. This is perfect!! Thank you so much for sharing this with us. DUH! Never mind! I found it! As I said, not fully awake yet. Hey! I’ve only had ONE cup of coffee! on my second now, so am getting there. Thanks again…this is really cute and am looking forward to getting it done. Amy is working on calculating the amount of yarns we used as it would apply for the other sizes. Once she has the details I will update the post. Child Size 2 in DK weight is starting chain of 36. Then you go to the first post and start using your starting chain instead of the one I used in the post. The post is written (all posts) to apply to any starting chain we have given in the charts above – the end of row counts listed apply to the sizes Amy and I are crocheting. If you are looking for a different size – find the size across the top and the starting chain is the 4th row down DK (KPG) Starting Chain Stitches. Curious timing, since I’ve just decided to make a poncho for my granddaughter! I am a bit confused about starting chain – plan to use Stylecraft Special DK and need to make child size 2. I see the length/width of finished rectangles….not sure where to start to achieve that. The starting chain – is that going to reflect the finished length of strip? Maybe I’m just not fully awake here….but want this right. This is a great pattern – and your timing in announcing could not be more perfect! I was just looking for poncho patterns last night! I absolutely LOVE this design!!! Now I just have to decide what size to do first 🙂 I have several people on my gift list that will absolutely adore this poncho. I’m thinking that I will do one in my own size first and I’m going to use Coral, Yellow, and Gray for the colors. Thank you for offering such a great CAL. Cute poncho. I want to use Hobby Lobby’s I Love This Yarn and make and adult s/m in 2 colors ,how much would I need? Love this and so does 6 year old granddaughter! Look forward to making this for her. Wow, so many sizes! I think a coordinating mother/daughter set would be sweet. Thank you both for working this out for us! I have a great-niece this will e perfect for! Can’t wait! This is a fantastic pattern, love it to bits. Especially all the sizes.